Monique Garsaud ‘86, J.D. ‘97, has been selected as the new director of the Career Development and Law Practice Center, formerly known as the Office of Career Services, at Loyola University New Orleans College of Law. 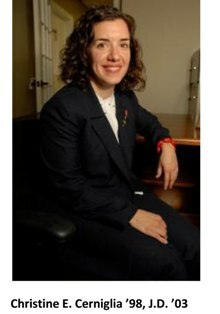 Garsaud succeeds interim director Stephanie Jumonville, J.D. ‘86, current associate dean of students in the College of Law. The Career Development and Law Practice Center's mission is to equip law students and alumni with the ability to define and achieve their career aspirations and assess their interests and values. Christine E. Cerniglia ’98, J.D. ’03, has been chosen as the new coordinator of the Office of Law Skills and Experiential Learning, formerly known as the Office of Law Skills. Cerniglia, currently a professor at Atlanta’s John Marshall Law School, will also join the faculty ranks as an assistant clinical professor of law and will oversee all College of Law externship placements. She succeeds current interim director Majeeda Snead, J.D. ’84, clinical professor in the Stuart H. Smith Law Clinic and Center for Social Justice. The skill courses are designed to present students with an experienced legal worldview and provide them with the proper tools to practice law as skilled advocates and sensitive counselors at law. Cerniglia begins May 15. College of Law Dean María Pabón López, J.D., said both Garsaud and Cerniglia’s legal practice background and long-lasting relationship with Loyola make them perfect matches for these positions. “Monique has been a guest lecturer and has served as treasurer of the College of Law alumni board, which will be a great advantage in cultivating relationships with legal employers, alumni and other members of the legal community. 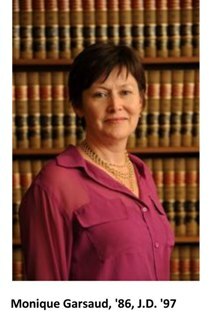 Her experience in the practice of law and in the formation and training of young lawyers is invaluable to our students seeking employment opportunities in the current legal market. Christine has a background in teaching and moot court training and competition, which is perfect for law skills, which is focused on real-life experience in teaching. I believe their connection to not only New Orleans, but the College of Law, will be an asset to the goals of both offices and the students here,” López said. Garsaud comes from Irwin Fritchie Urquhart & Moore LLC, where she served as a member from 2005-11 and an associate from 2001-04. She served as local and coordinating defense counsel for large and reputable pharmaceutical product and medical device manufacturers for all phases of litigation and she also oversaw annual operational litigation budgets and quarterly forecasts for multiple product files, ranging from $400,000 - $4 million. As a member of the firm, Garsaud was actively involved in the recruiting and training of associates for the firm. Prior to that, she was an associate for Hulse & Wanek law firm from 1999-2001. Garsaud defended claims against U.S. based property and casualty insurers and conducted research and discovery in defense of cases involving slips and falls, motor vehicle accidents and construction contracts. In 2011, American Lawyer named Garsaud a Best Lawyer in areas of mass tort litigation and products liability litigation. She was also awarded a key to city of New Orleans by Mayor Mitch Landrieu for participating in the creation of the Charitable Contribution Fund, Propulsid® MDL-1355, which allocated $1 million for a health care facility in New Orleans East and $7.3 million for other primary care facilities in Orleans, Jefferson, Plaquemines and St. Bernard parishes. “I hope to bring my years of experience in private practice and my mentorship of young lawyers to support the dean’s vision of producing law graduates with practical skills,” Garsaud said. At John Marshall Law School, Cerniglia is an assistant professor of law in the skills program. From 2009-11, she served as a visiting professor of legal skills at Stetson University College of Law in Gulfport, Fla., where she also served as a moot court practice judge and coached Stetson’s Pre-Trial Moot Court team. From 2006-09, Cerniglia served as a staff attorney for the State of Florida‘s Sixth Judicial Circuit, where she assisted with pressing legal issues relevant to Florida’s state courts, specifically the overwhelming foreclosure docket and the underfunding of state trial courts. She was a volunteer with the New Orleans Criminal Indigent Defender Program from 1997-99. For more information, contact James Shields in the Office of Public Affairs at jshields@loyno.edu.